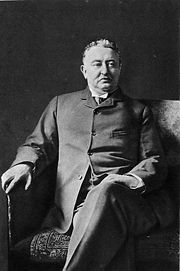 Cecil John Rhodes, PC, DCL (July 5, 1853 – March 26, 1902) was a British-born South African businessman, mining magnate, and politician. Rhodes was born in Bishop's Stortford in Hertfordshire and became the founder of the diamond company De Beers, which today markets 60 percent of the world's rough diamonds. At one time De Beers controlled 90 percent of the global diamond market. Rhodes was an ardent believer in colonialism and was the colonizer of the state of Rhodesia, which was named after him. Rhodesia (later Northern and Southern Rhodesia) eventually became Zambia and Zimbabwe respectively. Rhodes profited greatly by exploiting Southern Africa's natural resources, proceeds of which founded the Rhodes Scholarship upon his death. Rhodes is famous for having declared: "All of these stars … these vast worlds that remain out of reach. If I could, I would annex other planets." In the context of what has been called the Scramble for Africa, Rhodes was one of the most significant and influential promoters of Britain's imperial interests. He believed that British power could make war an impossibility, since Britain would police the world. He thought the British were destined to rule other peoples, for whose rights he had little concern. Despite his racist assumption many students from former British colonies have benefited from the Rhodes Scholarship. Rhodes was born in 1853 in Bishop's Stortford, Hertfordshire, England. He was the son of Rev. Francis William Rhodes, a Church of England priest, and his wife Louisa Peacock Rhodes. He had many siblings, including Francis William Rhodes, an army officer. As a teenager he dropped out of grammar school because of ill health and he was sent to Natal in South Africa because his family thought the hot climate there would improve his health. There he was to help his brother Herbert on his cotton farm. After a brief stay with the Surveyor-General of Natal, Dr. P. C. Sutherland, in Pietermaritzburg, Rhodes took an interest in agriculture and joined his brother Herbert on his cotton farm in the Umkomaas valley in Natal. In the colony, he established the Rhodes Fruit Farms in the Stellenbosch district. In October 1871, Rhodes left the colony for the diamond fields of Kimberley. He supervised the working of his brother's claim and speculated on his behalf. Among his associates in the early days were John X. Merriman and Charles Rudd, who later became his partner in the De Beers Mining Company and Niger Oil Company. After he first came to Africa, Rhodes supported himself with money lent by his Aunt Sophia. Rhodes attended the Bishop's Stortford Grammar school. In 1873, Rhodes left his farm field in the care of his partner, Rudd, and sailed for England to complete his studies. He was admitted to Oriel College, Oxford, but stayed for only one term in 1873, leaving for South Africa and returning for his second term in 1876. He was greatly influenced by John Ruskin's inaugural lecture at Oxford, which reinforced his own attachment to the cause of British imperialism. Among his Oxford associates were Rochefort Maguire, later a fellow of All Souls College and a director of the British South Africa Company, and Charles Metcalfe. His university career engendered in him an admiration for the Oxford "system" which was eventually to mature into his scholarship scheme: "Wherever you turn your eye—except in science—an Oxford man is at the top of the tree." 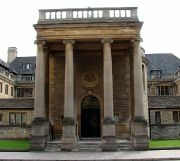 While attending Oxford, Rhodes became a Freemason. Although his initial view of it was not approving, he continued to be a Freemason until his death in 1902. He was appalled by the fact that the Masons had so much influence and yet they did not use it to try to make changes in society and he disliked Masonry because it was apolitical. But he later decided to start his own secret society with the goal of bringing the entire world under British rule. Whilst at Oxford, Rhodes continued to prosper in Kimberley. Before his departure for Oxford, he and C. D. Rudd had moved from the Kimberley mine to invest in the more costly claims of what was known as old De Beers (Vooruitzicht) which owed its name to Johannes Nicolaas de Beer and his brother, Diederik Arnoldus de Beer, the original owners of the Vooruitzicht farm. In 1874 and 1875, the diamond fields were in the grip of depression, but Rhodes and Rudd were among those who stayed to consolidate their interests. They believed that diamonds would be numerous in the hard blue ground that had been exposed after the softer, yellow layer near the surface had been worked out. During this time, the technical problem of clearing out the water that was flooding the mines became serious and he and Rudd obtained the contract for pumping the water out of the three main mines. It was during this period that Jim B. Taylor, still a young boy and helping to work his father's claim, first met Rhodes. In April 1880, Rhodes and Rudd launched the De Beers Mining Company after the amalgamation of a number of individual claims. With £200,000 of capital, the Company, of which Rhodes was secretary, owned the largest interest in the mine. In 1880, Rhodes prepared to enter public life at the Cape. With the incorporation of Griqualand West into the Cape Colony in 1877, the area obtained six seats in the Cape House of Assembly. Rhodes chose the constituency of Barkly West, a rural constituency in which Boer voters predominated. Barkly West remained faithful to Rhodes even after the Jameson Raid, and he continued as its member until his death. The chief preoccupation of the Cape Parliament when Rhodes became a member was the future of Basutoland, where the ministry of Sir Gordon Sprigg was trying to restore order after a rebellion, the Gun War, in 1880. The ministry had precipitated the revolt by applying its disarmament policy to the Basuto. In 1890, Rhodes became Prime Minister of the Cape Colony and implemented laws that would benefit mine and industry owners. He introduced the Glen Grey Act to push Africans from their lands and make way for industrial development. Rhodes' policies were instrumental in the development of British imperial policies in South Africa. He did not, however, have direct political power over the Boer Republic of the Transvaal. He often disagreed with the Transvaal government's policies, and felt he could use his money and his power to overthrow the Boer government and install a British colonial government supporting mine-owners' interests in its place. In 1895, Rhodes supported an attack on the Transvaal, the infamous Jameson Raid. 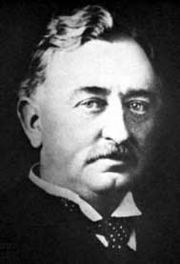 The raid was a catastrophic failure which forced Cecil Rhodes to resign as Prime Minister of Cape Colony, sent his oldest brother, Col. Frank Rhodes, to jail in Transvaal on high treason and nearly resulted in his hanging, and lead to the outbreak of both the Second Matabele War and the Second Boer War. Caricature by Edward Linley Sambourne, published in Punch after Rhodes announced plans for a telegraph line from Cape Town to Cairo. Rhodes used his wealth and that of his business partner Alfred Beit and other investors to pursue his dream of creating a British Empire in new territories to the north by obtaining mineral concessions from the most powerful chiefs. Rhodes' competitive advantage over other mineral prospecting companies was his combination of wealth and the "imperial factor," his use of the British Government: He made friendships with its local representatives, the British Commissioners, and through them organised British protectorates over the mineral concession areas via separate but related treaties, conferring both legality (however thin) and security for mining operations. He could then win over more investors. Imperial expansion and capital investment went hand in hand. 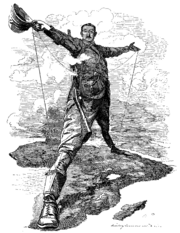 The imperial factor was a double-edged sword: Rhodes did not want it to mean that the bureaucrats of the Colonial Office in London would interfere in the Empire in Africa. He wanted British settlers and local politicians and governors, like himself, to run it. This put him on a collision course with many in Britain, as well as with British missionaries who favored what they saw as the more ethical direct rule from London. But Rhodes won because he would pay to administer the territories north of South Africa against future mining profits, the Colonial Office didn't have the funds to do it, and his presence would prevent the Portuguese, the Germans or the Boers from moving in to south-central Africa. Rhodes' companies and agents cemented these advantages by using deceit and deception to obtain many of the mining concessions, as exemplified by the Rudd and Lochner Concessions. Rhodes had already tried and failed to get a mining concession from Lobengula, king of the Ndebele of Matabeleland. In 1888 he tried again using the imperial factor, and deception. He sent John Moffat, son of the missionary Robert Moffat who was trusted by Lobengula, to persuade the latter to sign a treaty of friendship with Britain, and to look favourably on Rhodes' proposals. His agent Charles Rudd assured Lobengula that no more than ten white men would mine in Matabeleland, but this was left out of the actual document Lobengula signed, the Rudd Concession. Furthermore it stated that the mining companies could do anything necessary to their operations. When Lobengula discovered later what the concession really meant, he tried to renounce it, but the British Government ignored him. Armed with the Rudd Concession, in 1889, Rhodes obtained a charter from the British Government for his British South Africa Company (BSAC) to rule, police and make new treaties and concessions from the Limpopo River to the great lakes of Central Africa. He obtained further concessions and treaties north of the Zambezi, such as those in Barotseland (the Lochner Concession with King Lewanika in 1890, which was deceitful in a similar way to the Rudd Concession), and in the Lake Mweru area (Alfred Sharpe's 1890 Kazembe concession). Rhodes also sent Sharpe to get a concession over mineral-rich Katanga, but met his match in ruthlessness: When Sharpe was rebuffed by its ruler Msiri, King Leopold II of Belgium obtained a concession over Msiri's dead body for his Congo Free State. Rhodes also wanted Bechuanaland Protectorate (now Botswana) under the BSAC charter but three Tswana kings including Khama III travelled to Britain and won over British public opinion for it to remain governed by London. Rhodes commented: "It is humiliating to be utterly beaten by these niggers." The British Colonial Office also decided to administer British Central Africa (Nyasaland, today's Malawi) owing to the presence there of Scottish missionaries trying to end the slave trade. Rhodes paid much of the cost so that the British Central Africa Commissioner, Sir Harry Johnston (and his successor, Alfred Sharpe) would assist with security in the BSAC's north-eastern territories. Johnston shared Rhodes' expansionist views, but he and his successors were not as pro-settler as Rhodes and disagreed on dealings with Africans. The BSAC had its own paramilitary police force, which was used to control Matabeleland and Mashonaland, in present-day Zimbabwe. The company had hoped to start a "new Rand" from the ancient gold mines of the Shona, but the gold had been largely depleted long before, so many of the white settlers who accompanied the British South Africa Company to Mashonaland became farmers. When the Ndebele and the Shona—the two main, but rival tribes—separately rebelled against the coming of the white settlers, the British South Africa Company defeated them in the two Matabele Wars (1893-94; 1896-97). Shortly after learning of the assassination of the Ndebele prophet, Mlimo, at the hands of the American scout Frederick Russell Burnham, Rhodes showed great courage when he boldly walked unarmed into the Ndebele stronghold in Matobo Hills and persuaded the impi to lay down their arms, thus ending the Second Matabele War. By the end of 1894, the territories over which the BSAC had concessions or treaties, collectively called "Zambesia" after the Zambezi River flowing through the middle, comprised an area of 1,143,000 km² between the Limpopo River and Lake Tanganyika. In May 1895, its name was officially changed to "Rhodesia," reflecting Rhodes' popularity among settlers who had been using the name informally since 1891. The designation Southern Rhodesia was officially adopted in 1898 for the part south of the Zambezi which later became Zimbabwe, and the designations North-Western and North-Eastern Rhodesia were used from 1895 for the territory which later became Northern Rhodesia, then Zambia. Rhodes wanted to expand the British Empire because he believed that the Anglo-Saxon race was destined to greatness. He wanted to make the British Empire a superpower in which all of the white countries in the empire, including Canada, Australia, New Zealand, and Cape Colony, would be represented in the British Parliament. Rhodes included Americans in the Rhodes scholarships and said that he wanted to breed an American elite of philosopher-kings who would have the U.S. rejoin the British Empire. Rhodes also respected the Germans and admired the Kaiser, and allowed Germans to be included in the Rhodes scholarships. He believed that eventually Great Britain, the U.S., and Germany together would dominate the world and ensure peace together. Though Rhodes is considered by historians to have been an extreme imperialist and racist, in his opinions on domestic politics within the United Kingdom Rhodes was a supporter of the Liberal party. Rhodes' only major impact on domestic politics within the United Kingdom was his support of the Irish nationalist party, led by Charles Stewart Parnell (1846-1891). He contributed a great deal of money to the Irish nationalists, although Rhodes made his support for the Irish nationalists conditional upon an autonomous Ireland still being represented in the British Parliament. Rhodes was such a strong supporter of Parnell that even after the Liberals and the Irish nationalists had disowned Parnell because of his adultery with the wife of another Irish nationalist, Rhodes continued to support him. Rhodes was much more tolerant of the Dutch-speaking whites in the Cape Colony than the other English-speaking whites in the Cape Colony were. He supported teaching Dutch as well as English in public schools in Cape Colony and even loaned money to support this cause. Also while Prime Minister of Cape Colony he helped to remove most of the legal disabilities that English-speaking whites had imposed on Dutch-speaking whites. He was a friend of Jan Hofmeyr, leader of the Afrikaner Bond, and became Prime Minister of Cape Colony largely because of Afrikaner support. Rhodes also advocated greater self-government for his country, the Cape Colony, which was one of the reasons that he did not get along with the British government. 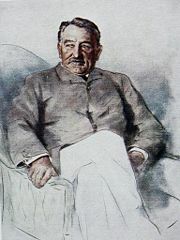 Although Rhodes remained a leading figure in the politics of southern Africa, especially during the Second Boer War, he was dogged by ill health throughout his relatively short life. Rhodes died in 1902, and was considered at the time one of the wealthiest men in the world. 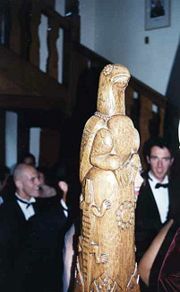 Zimbabwe Bird banister in Rhodes House. In his last will and testament, he provided for the establishment of the Rhodes Scholarships. The scholarship program enables students from territories under British rule, formerly under British rule, or from Germany, to study at the University of Oxford. Rhodes' will also left a large area of land on the slopes of Table Mountain to the South African nation. Part of this estate became the upper campus of the University of Cape Town, part became the Kirstenbosch gardens, while much was spared from development and is now an important conservation area. Rhodes Memorial stands on Rhodes' favorite spot on the slopes of Devil's Peak, with a view looking north and east towards the Cape to Cairo route. Rhodes' house in Cape Town, Groote Schuur, has been inhabited by the ex deputy president Jacob Zuma. The cottage in Muizenberg where he died is a national monument. Rhodes was laid to rest at World's View, a hilltop located approximately 35 kilometers south of Bulawayo, in what was then Rhodesia. Today, his grave site is part of Matobo National Park, Zimbabwe. Rhodes decreed in his will that he was to be buried in Matobo Hills, so when he died in the Cape in 1902 his body came up by train and wagon to Bulawayo. His burial was attended by Ndebele chiefs, who asked that the firing party should not discharge their rifles as this would disturb the spirits. Then, for the first and probably the only time, they gave the white man the Matabele royal salute "Bayete." Rhodes is buried along side both Leander Starr Jameson and the 34 white soldiers killed in the Shangani Patrol. Rhodes' legacy is part and parcel of the story of colonialism. His empire in Southern Africa exploited and disregarded the rights of the people already living on the lands. Rhodes was a racist, and his belief in the supremacy of the white race determined the course of his actions, which laid the groundwork for apartheid policies and contributed to the suffering of many people, suffering that continues to this day. On the positive side, the Rhodes Scholarship is considered to be one of the most prestigious international academic awards, enabling students from territories formerly under British rule to study at Rhodes' alma mater, the University of Oxford. Close to 8,000 young people have received these scholarships. ↑ Death Of Mr. Rhodes, The Times, March 27, 1902, 7. ↑ Sarah Gertrude Millin, Rhodes (London: Harper & Bros, 1933), 138. ↑ 3.0 3.1 3.2 Anthony Thomas, Rhodes: The Race for Africa (London: Penguin, 1997, ISBN 978-0140266528). ↑ 4.0 4.1 John Flint, Cecil Rhodes (Boston: Little Brown and Company, 1974, ISBN 0316286303). ↑ £200,000 (1880) = ~£12.9m (2004) =~ $22.5m. ↑ 6.0 6.1 6.2 6.3 Neil Parsons, A New History of Southern Africa (London: Macmillan, 1993, ISBN 978-0333570104), 179-181. ↑ Byron Farwell, The Encyclopedia of Nineteenth-Century Land Warfare: An Illustrated World View (W. W. Norton & Company, 2001, ISBN 978-0393047707). Millin, Sarah Gertrude. Rhodes. London: Harper & Bros, 1933. All links retrieved April 5, 2018. Cecil Rhodes: Lowdown Thief or Hero for the Nation? This page was last modified on 18 April 2018, at 16:41.